A Static IP Address is a fixed IP Address that is configured on the settings of a computer or router. Some Internet Service Providers (ISP) require you to enter a Static IP Address on your computer or router’s TCP/IP settings so you can connect to the Internet. NOTE: If you are using the latest Linksys Smart Wi-Fi Routers, click here for instructions on how to setup Static IP through the Linksys cloud account instead. ii. Make sure that there is an active Internet connection when you connect the computer directly to the modem using an Ethernet cable. Check if you can go online using the Static IP Address on your computer. If not, contact your ISP. iii. If you just switched ISPs and you are now using a Static IP connection, you need to reset your router first. To do this, press and hold the Reset button for 10 seconds using a pen or a paper clip then unplug the router from the power outlet for 30 seconds and plug it back in and wait for the Power LED to be solid. After verifying your Internet connectivity, connect the modem to the Internet port on the router and your computer to one (1) of the numbered Ethernet ports. NOTE: The images may vary depending on the model of your router and the type of computer and modem you are using. After connecting your devices to the router, verify if they are working properly by checking the LEDs on the router's front panel. For instructions on how to do this, click here. Your computer should be set to obtain IP Address so it can communicate with the router. To learn how to do this, click here. Access the router’s classic web-based setup page. Open any web browser (Internet Explorer®, Mozilla Firefox®, or Safari®) and enter “192.168.1.1” in the Address bar then press [Enter]. You will be asked for your login details. 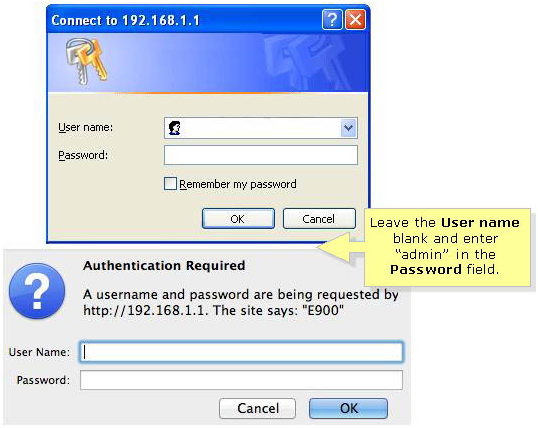 Leave the User name field blank and enter “admin” in the Password field then click OK.
On the Setup page, select Static IP for the Internet Connection Type then enter the Internet IP Address, Subnet Mask, Default Gateway and DNS provided by your ISP. If you’re using a Linksys Wi-Fi Router, you can manually install Linksys Connect after setting up the router with a Static IP. For instructions, click here.